Mexican Food Serving Plates and Containers for Restaurants, Cantinas, Caterers, and More! Our restaurant-quality Mexican Food Tableware is made of durable Melamine plastic, which ensures years of use. You can choose from Taco Holders, Tortilla Servers, Salsa Servers, Molcajete Bowls, and other tableware for serving Mexican food. 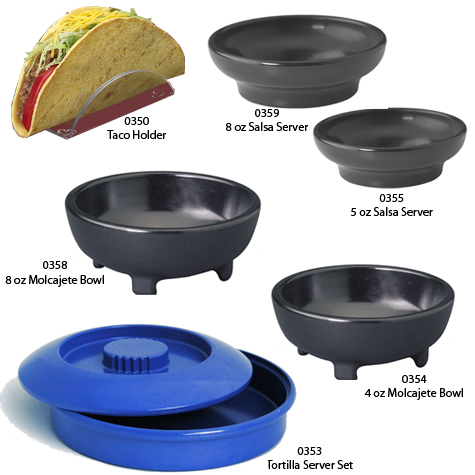 For more information on any of our Mexican Food Tableware, please contact us at 1-800-233-0828. You might also be interested in our Restaurant Ramekins, Coffee Service Sugar Caddies, and Customized Drinkware.